In 2018 Coven Life’s Coven and website have had some highs and lows but our highs outnumbered the lows. Our coven, novice and adept numbers grew. We saw our first Priestesses and Priest start to study and help with the day to day running of many parts Coven Life. Our gatherings for Esbats and Sabbats grew in attendance with not only coven members but guests as well. We were inspired by rituals written and lead by adepts and Priestesses. Our coven grew closer as a family during a very bad time and in times that members needed support and help. We also celebrated good times members had as a spiritual family. Our coven has grown in numbers as well as our school enrolling more novices and novices moving up to adepts. We have or had members from every continent but Antacrtica and are looking forward to growing our coven family even more. The worse time for myself and the coven was my mistake in judging someone and having to banish them because as a psychic vampire they were draining power and life force from myself and power from other coven members. But we made it through that and grew stronger individually and as a whole. One of our best times was holding a ritual for a transgender member as she faced her last surgery to be in the body she should have been born into. The support and love our coven showed for her by attending and participating in the ritual was nothing short of heartwarming. Then too we all continued to show our support and love with sending her messages so she knew we were thinking of her, healing, lighting candles, and praying for a rapid recovery from the surgery. I a, very happy to say that I have talked with her almost daily and her recovery is going very well and that she is grateful to all her brothers and sisters for their love, support, and healing sent to her. I went through a period of recovery from being drained by the psychic vampire. Without the support, love, and forgiveness from my coven and our Priestess Hypatia taking over running Coven Life for a while, I would not be in a position to be writing this. I also had minor knee surgery when again my right-hand witch Priestess Hypatia took the responsibilities of running CL over for a few days along with love, support, and healing from coven members and other people my recovery was quicker than the doctor expected for a person my age – for those of us 60 and over don’t you just love it when someone uses the phrase “for a person your age?” Only kidding you probably think like I do what does a number assigned to the years I have lived in this lifetime have to do with anything? Other brothers and sisters in the coven family have had medical problems and every time we as a family have rallied around our brother or sister to support and help them heal through love, spells, sending energy and lighting candles. Priestess Hypatia was able to take some spiritual retreats that we are hoping she will share a bit more about them in the coming year. While these are just the major highlights of 2018, I would love for coven members and our other readers to let us know what your high and/or low has been for the past year please share it or them with us in the comments below. If it is an ongoing medical problem and you would like us to send healing or support or whatever you may need from us please leave a comment letting us know how we can help. All in all 2018 has been a fantastic year for me as CL’s High Priestess and also just a regular coven member. I thank all of my brothers and sisters for all the love, support, and being an extended family not just to me but to each other as well. We ring out 2018 together as a spiritual family and will (or have already in the Southern Hemisphere) ring in 2019 as a strong one. MAy everyone reading this have a blessed new year filled with more love, happiness, less stress, learn and teach each other more about The Craft, and have many wonderful things happen in your life. I had some words with someone yesterday and it got me to thinking I was not being tolerant of how the other person thought of me. I came to realize that the way others thought of me is not as important as how I think of myself. While we all come into contact with people we just for whatever reason do not get along with in any way no matter what the circumstances might be that brought us together in the first place. Even if our relationship with the person starts off in a congenial way and you might not have a clue as to why the other person suddenly attacks you verbally and/or in writing in any way they can and every chance they see. So I decided it was a good time for me to remember tolerance and maybe by sharing it with others their view may change a little about someone they have a problem with. I found the following article well written and it does have good ideas for how you not the other person treat people you come into contact with. Now I know I will not get along with everyone I meet but at least I can come away feeling better about the encounter if I practice tolerance of others. I will take this chance to apologize to the person I had words with yesterday for being intolerant of them as a person. Lady of the Abyss asks that if you come into theWOTC chatroom late you do so quietly, please. The problem with being a healer is that people will take advantage of you. They sense your ability and are attracted to you. There’s something about you that makes them feel good, at peace, and happy. If only it worked both ways. N.H Ostara / S.H Mabon- Gathering on 20th, March 2018. Circle starts at 7:15 PM CT SHARP. Our Ostara/ Mabon gathering was written by Hypatia who will be leading this gathering. Circle starts at 7:15 PM CT SHARP. 30 minutes will be allocated for a chance to talk to our Brothers and Sisters. Please do not enter the chat room once the circle has started. Thank you! We are going to be painting eggs……. As this is a time for a clean start– consider taking a bath or a shower with your favorite essential oil or other aromatics. You could also infuse fresh herbs like a tea or use your favorite soap. If a whole body wash is not possible please just wash your hands, face or even just change into clean clothes. What will encourage your new growth? Hard-boiled egg for decorating. You could do more than one if you like. No more than 3, mainly for time purposes. If allergic please refer to suggestions below. Permanent marker pens or small stickers to decorate the eggs. Practice your patters beforehand if you wish, it might make it easier and quicker on the day. Keep it simple, not to thick or elaborate as we will be cracking and eating the egg. If you have an egg allergy than please use gloves when handling the egg, crack the egg and place in the nest. You could place it in the earth or just give to a loved one that doesn’t have an egg allergy to consume. Freshly picked flowers or herbs to place on you alter. Green and Yellow candle. If you don’t have these colours please just use what is on hand. It is the spirit of the Goddess and the God created by the light that we will be using as inspiration. A little bowl, egg holder or just a little nest made from cotton wool to hold you egg once finished. Be as creative as you wish. Egg baskets are also great. A glass of water to help with the feasting. Simple flower or leaf motifs will do. Anything that inspires the artist within and brings images of fresh beginnings. Remember to keep it simple as we will be cracking and eat the egg (avoid eating and handling without gloves if allergic, please see above suggestions). In this case please have a glass of whatever beverage you prefer and a piece of simple whole grain bread to feast on. If you have another preference than please do so. Your health is in your hands. It doesn’t have to be drawn all over the egg. If you choose to do a Goddess symbols than please do. This is a time for you to connect with the Goddess, the Earth Mother and all the possibilities that she brings. Simple spirals will even do. You may even have your own symbol that brings forth the Great Goddess called by Persephone, Brigid, and Eostre. We are going to be preparing a feast………..
As this is the time of the fruit harvest we will be using an apple to represent the cornucopia of life. Green and red candle. If you don’t have these colors please just use what is on hand. It is the spirit of the Goddess and the God created by the light that we will be using as inspiration. A knife to cut your apple, horizontal across the middle to reveal the pentagram within. You can even practice this beforehand if you wish. (Please be careful not to cut yourself, your safety is in your hands). A platter for offering and cutting board to cut your apple and other fruits. A bowl filled with fresh seasonal fruits such as apples, pears and seasonal berries and even dried nuts, depending on their availability, your imagination and of course you budget. Whatever you can get your hands on. Remember it’s your feast dedication to the Great Goddess and God! The remainder of the fruit and nuts could be shared with family, friends or even acquaintances after the ceremony. Apple cider or just a glass of water will do. Candles for the God and Goddess the colors specified above, otherwise any color available (don’t forget you candle holders if needed). , use matches (with safety) or you could use a single pillar candle that you have blessed, anointed and inscribed. You use this to light your God and Goddess candles. The choice is yours as it is in the intention. Remember to keep it simple. If you wish to add more depending on you practice and worship than please do so. Just remember to add each magical item in reverence. Ostara is the beginning of spring, the season for new beginnings and the renewal of life through planting. This is the time we can now plant seeds and nurture them throughout the coming months to bare their fruit. What is it that you would like to plant in your life? What are you willing to nurture throughout the growing season? For this ritual as this season is also a time for re-birth, new life and fertility we will be concentrating on the symbology of the egg. The ritual will be dedicated to the Great Goddess, Persephone, Brigid, and Eostre. 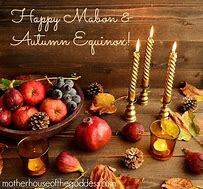 Mabon is the second of 3 harvest festivals celebrating the equinox and the harvest of apples. On the day of the equinox, day and night is of equal length. For the next 6 months the nights will be longer than the days. This is such a great time of abundance. All the hard work that it takes to collect the harvest, it is now a time to rest, reap what you have sown and take the time to look at you hopes and aspirations and reflect how they have manifested. Most importantly spend it with the people you love. This is a time of giving, sharing and loving. Think of the dark and light as the feminine and the masculine. The Goddess and the God resorting your outer and inner balance. Concentrate on the beautiful flowers you have picked, smell, and touch and appreciate this glorious gift from the Great Mother and Father. Take your hardboiled egg in your hands, feel its contours and acknowledge the gift and nourishment that it holds. Understand that this is a time of regeneration and transformation. This is a time of re-birth and new beginnings. Visualize the creation of all and everything from a single seed a single egg. Pick up the apple and hold it in both hands. Feel its smoothness. See its colour. Smell its fragrance. “Lord of the Sun that rides the westerly wild wind. As the seeds flourish and the fall into the waiting earth. I know this to be a time of equals allowing natures scales to come into balance. As the dark winter shadows reveal the wheel-a-turning it unveils life’s glory through a deathly silence. Now prepare your tools to decorate. As you decorate your eggs meditate on creation, on rebirth and the wonder of life. Appreciate and acknowledge that this is the place where everything starts from. Be spontaneous and draw whatever mandala comes to your mind or something that you have already chosen. Allow yourself to enjoy the energy of creation. Visualize what you would like to bring into your life. What you would like to bring into fruition, what you would like to give birth to. This is a time of great fertility, you hold the egg in your hand, the egg that will give life to your desires. In your own words give thanks to the great Goddess for her gift of regeneration, rebirth and rejuvenation. If allergic- you can place the egg/s in your nest, bowl or holder and give to a loved one after the ceremony or bury in the ground. I will leave that up to you. Otherwise– crack the egg on the surface, peel the egg and consume as much as you like and with every bite appreciate the gift of regeneration and rebirth. The glory of new beginnings that is gifted from the Great Mother Herself. Keep a glass of water on hand. Place the apple on your chopping board and cut across the middle (horizontally) exposing the pentagram. The pentagram is connected to the 5 elements. Allow yourself time to connect to water, fire, earth, air and spirit as without these we would not exist. Breathe in the scent. Understand that the apple is a simple reminder of the healing powers of the earth and the restorative energies of the Other world’s. Now take a bite of the apple and allow it to nourish you. Feel how refreshing it is and how it is filling you with its nourishment. Now prepare the rest of you platter by adding from your fruit bowl. This is a dedication to your God and Goddess. Take your time to enjoy and savior the feast that you have prepared. Drink your apple cider, water or what other beverage you have chosen. In your own words give thanks to the great God and Goddess to this second harvest and all it has brought you. “Manannan mac Lir, I thank you for your presence and your blessings. May there be peace and honour between us now and forever. Hail and farewell. “Ancestors of blood and ancestors of spirit, I thank you for your presence and your blessings. May there be peace and honor between us now and forever. Hail and farewell. “Spirits of the land, spirits of this place, I thank you for your presence and your blessings. May there be peace and honor between us now and forever. Hail and farewell. And Now before closing the circle. I would ask that all non-members leave the circle at this time please. You are welcome to return in about 15 minutes to socialize. Thank you. We will be introducing the newcomer Elders and this is a private initiation.